The mobile platform has changed the face of video marketing. There will be 5.2 billion mobile consumers by 2019. 45% of all email marketing clicks come from mobile. On average, American consumers spend 91 hours per month working with video dependent apps and other video sources. 92% of these same consumers share video with like-minded consumers further increasing engagement. While that is a lot of stats to place against your marketing plan, a business has to wonder why they’re not already engaging such potential. Today’s share comes from Kahuna. 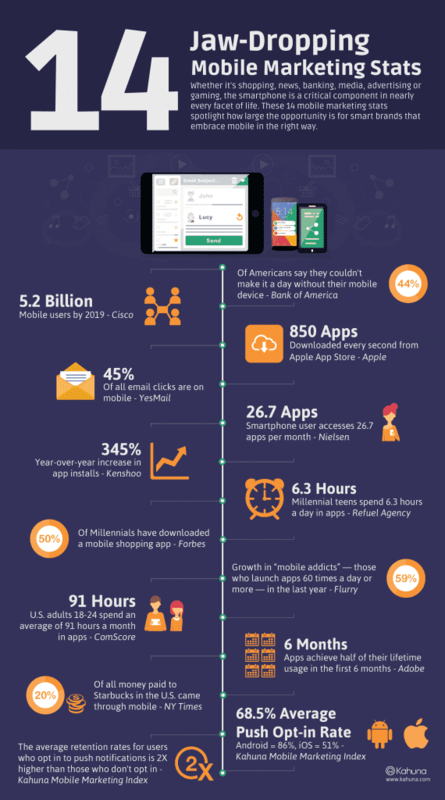 While the infographic focuses on the rise of the smartphone as preferred marketing venue, a business would do well to acknowledge other mobile platforms. Whether it be tablet or e-connected device, Internet marketing has to be immediate and ever present to survive. Year over year growth for mobile marketing has increased 345%. 80% of these same users can recall a mobile video ad that they’ve seen in the last month. When was the last time TV, radio or otherwise could match that potential shown in mobile marketing? Autodemo has discussed this phenomenon before, but now is the time to take action. The average American consumer is exposed to 32.3 videos on a monthly basis. Marketers know they are retaining this information and constantly revisiting these same mobile marketing channels. The key to what this infographic is presenting is to be present. Will your videos be the first thing that a customer sees on their phone or are you going to let your rivals get there first?